Continuity mistake: When the Iron Giant first learns to talk, he picks up a huge boulder that wasn't there earlier. The boulder was in a pretty big hole, but when Hogarth walks away the hole has disappeared. Continuity mistake: Throughout the film the size of the Iron Giant varies from being able to hide in a barn shed to sticking out well above a town to be spotted from a fair distance. A good example is when the Iron Giant launches himself after a fall from a cliff in front of Hogarth's mother. Continuity mistake: When Hogarth runs away from the Iron Giant, he crashes into a branch and falls to the ground. Yet in the next shot when he lies down on the ground, there is no tree near him. 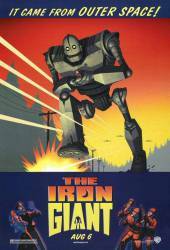 Continuity mistake: When the Iron Giant presses down the railroad, it still is slightly bent. Yet later on it is perfectly straight. Continuity mistake: When Hogarth knocks his face into the tree after running, he has a lot of blood on his face, but in the very next shot, in which he turns around after hearing the giant, the blood is gone. Continuity mistake: When the Iron Giant and Howgarth meet for the second time, they both sit down, and you can see that both the Giants hands are flat on the floor, then the Giant produces the electricity shut off switch from one of his hands even though both his hands were previously empty. Continuity mistake: The first time Manley looks at the BB gun, the name on the stock reads "HOG HUG." After his car disappears, he picks up the BB gun again, and now part of the A and part of the H is visible, and the G in the surname is now black rather than brown.